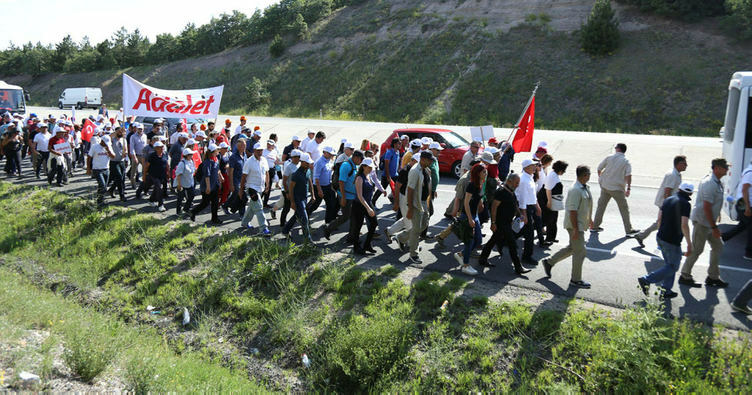 The 69-year-old Hasan Tatli had a heart attack during ‘March of Justice’, a 250-mile walk the main opposition Republican People’s Party (CHP) started against the government’s post-coup rights violations four days ago. Started a day after the arrest of CHP deputy Enis Berberoglu, the protest is expected to last some 23 days, covering a 250-mile distance from Ankara’s Guven Park to Maltepe district of Istanbul. Tatli, a retired civil servant thought to be a member of CHP’s local branch in Ankara’s Mamak district, suddenly fell to the ground while he was sitting with fellow protesters during a break the group took after a 70-minute walk around İğdir neighborhood on early Sunday. Even though earlier news articles reported his death, media later said that he is still alive, receiving treatment under intensive care unit at Hamdi Eriş State Hospital in Kazan, Ankara. Holding a white banner that reads “justice” in red letters, CHP leader Kemal Kilicdaroglu told media on Thursday that the group is marching in support of those who had been unjustly included in the government’s post-coup purge. Turkish government detained more than 120,000 people and arrested over 50,000 in the aftermath of the July 15, 2016 coup attempt. Meanwhile, some 130,000 people have lost hteir jobs over coup charges.